Long ago, it was believed by our native people that the salmon were actually warriors of the salmon people transformed when they were in the water. That is why it is customary to always put the bones back in the water after eating a salmon, so the warriors to return home safely after all. 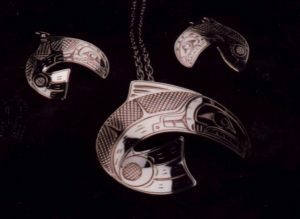 See also: pendant version.